Whether you prefer to call it D-Town, Metroplex or simply the Big D, one thing is certain aboutDallas: It’s an economic powerhouse that continues to flourish through economic ups and downs. The ninth largest city in the U.S., Dallas is home to 1.28 million people people, and the Dallas-Fort Worth metro region is one of the fastest growing in the nation. Both Dallas and the Lone Star State are booming, outpacing the national economy: Texas real gross domestic product grew by 3.7 percent in 2013, compared to only 1.8 percent for the entire country. Unlike many major cities, Dallas does not have a true terminal market. 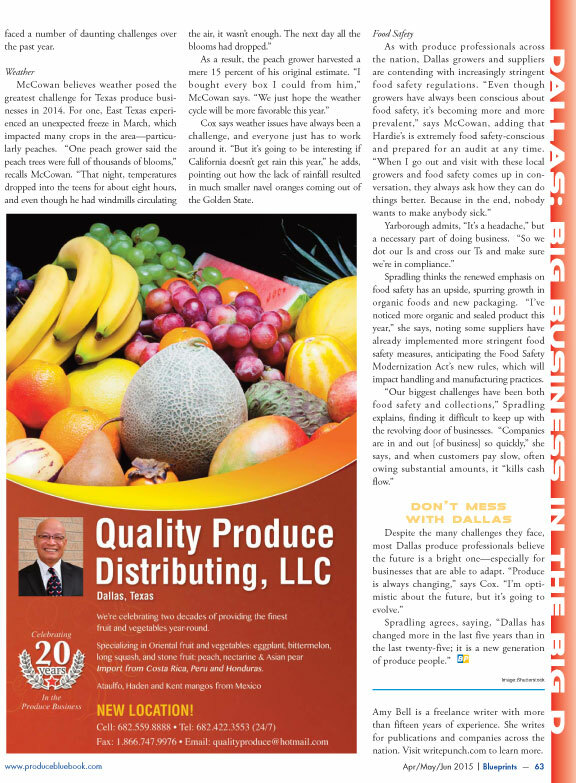 The majority of Dallas produce distributors, brokers, repackers, exporters and receivers are scattered outside of the city, where they enjoy easier access to highways and more affordable office and warehouse space. However, the Big D is home to the Dallas Farmers Market, which has operated in the heart of downtown since 1941. This bustling market attracts wholesale and retail shoppers with an assortment of locally grown produce, nursery items, prepared foods and bulk items. In 2013, the market officially went private when a group of local investors (DF Market Holdings) purchased the market. A few months later, the private group began a massive $65-million makeover of the market, will eventually include shops and restaurants, luxury condos and apartments, a community garden and a large recreational park.